I hope you all have a wonderful, safe and relaxing weekend! I have one more set of goodies for you. 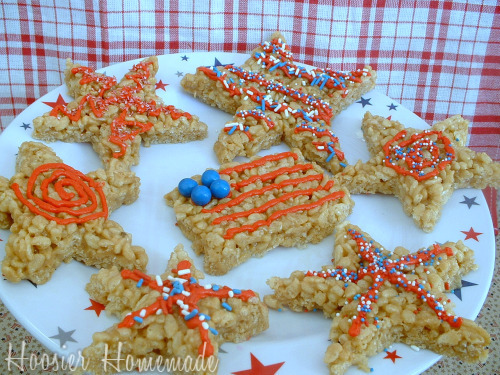 These No-Bake Treats are great for those hot summer days, and of course, perfect for the 4th of July! 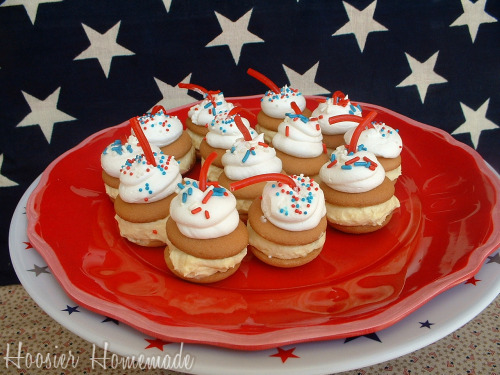 With just a few ingredients, you can whip up these cute little Firecracker Bites! Beat Cream Cheese in large bowl, until smooth, slowly add the milk. Add dry pudding mix and beat for 2 minutes. Spoon a heaping teaspoon of pudding mix onto Vanilla Wafer and top with another wafer to make a sandwich. Add a small amount of Whipped Topping to the top with a decorator bag (you could even use a Ziploc bag or just spoon it on. Add sprinkles and a 1 inch piece of licorice. Popsicles are great to have on hand throughout the summer, these Rocket Pops are not only festive for the 4th of July, but taste great too. Combine the Cherry Jello and 1/2 cup sugar in a medium bowl, stir. Add 1 cup boiling water, stir at least 2 minutes until dissolved. Add enough ice cubes to 1 cup of cold water to make 2 cups. Add to jello and stir until ice is melted. Pour evenly into 16 (5oz) paper or plastic cups. Freeze 1 hour. Meanwhile, mix blue jello and 1/2 cup sugar, adding water the exact same way you did for the Cherry jello. Refrigerate 1 hour. Spoon a couple heaping tablespoons of Whipped Topping onto Cherry jello, top evenly with blue jello. Freeze 1 hour or until almost firm, insert popsicle stick, freeze additional 4 hours or overnight. Run hot water on outside of cup to release Rocket Pop. And last, but not least, Rice Krispie Treats! An all time favorite in our house.I make them a little different than most though, I don’t use marshmallows. In a small saucepan, bring sugar and corn syrup to a slight bubble (do not boil) add peanut butter and stir well. Add to Rice Krispies, mix well and press into pan. You can use a cookie sheet or 15x10x2 pan. 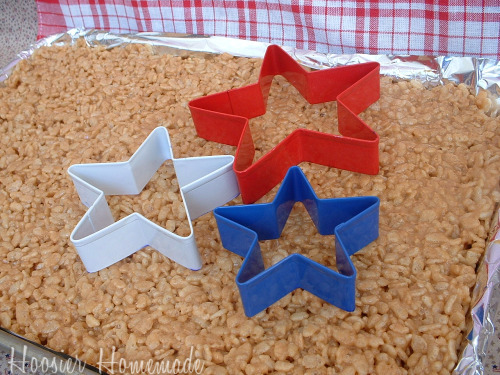 To make stars and flags, I lined a cookie sheet with foil and used the Wilton Star Cookie Cutters. For the flag I just cut it out free-hand. To decorate, I piped on a small amount of frosting and then added the sprinkles. The flag has blue sixlets candy. Enjoy! Happy 4th of July! 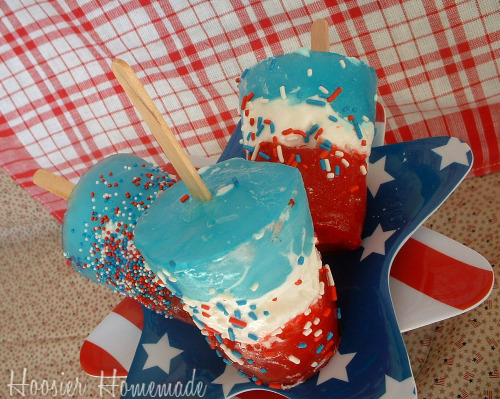 There is also a 4th of July Linky Party over on my other blog, It’s a Blog Party, with over 50 ideas! Lots of great stuff! What a great blog! I was drawn to the name of your blog since I grew up in Indiana, and I love the content! I’ll be visiting more often! @Nicole @ The Life of the Baseball Wife, Thanks for visiting Nicole! I’m so glad you found me! Where in Indiana did you grow up? @CupcakeLady, I grew up in Fort Wayne. What part are you from? @Nicole @ The Life of the Baseball Wife, We are in NW Indiana, about 15 minutes from Lake Michigan. What a great blog! I just found this, and I’ll be coming back to check things out more often! I grew up in Indiana, so I obviously was drawn to the name of your blog, and I love the content too! 4th of july was sure sweet at your house! Love these. I love the fire cracker bites, they are so adorable. I’m hoping to get something baked today 🙂 for the 4th! Oh! Those all look so yummy! 🙂 I went lazy… err I mean EASY for the 4th. 🙂 Watermelon and ice cream. LOL!